Current guidelines from the American Geriatrics Society (AGS) state that "NSAIDs and COX-2 selective inhibitors may be considered rarely, and with extreme caution, in highly selected individuals" for the treatment of chronic pain. This was largely due to their risky side effect profile that includes worsening hypertension, edema, heart failure, and renal failure. The guidelines also state that "all patients with moderate-severe pain, pain-related functional impairment or diminished quality of life due to pain should be considered for opioid therapy". But what about the risks of using opioids? Are they truly any safer than NSAIDs? The Journal of the American Geriatrics Society (JAGS) recently published a retrospective cohort study comparing the risk of fracture associated with initiating opioids with that of initiating NSAIDs. Long story made short – initiating opioids seemed to be riskier than initiating NSAIDs (at least in regards to fractures). My questions about this study are numerous, but first I'll lay down some of the specifics on what they did in this study. The population of the study consisted of medicare beneficiaries with arthritis who were enrolled in two statewide drug benefit programs, and who initiated monotherapy with a NSAID or an opioid between 1999 and 2006. The drug benefit programs gave the authors pharmacy data including information on all prescriptions, dosages, days supply, and quantity dispensed for each medication and the date dispensed. 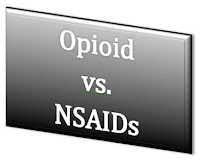 In total, the authors analyzed 12,436 opioid initiators and 4,874 NSAIDs initiators. These patients were mostly female (85%), and most had osteoarthritis. The authors defined "initiating" opioids or NSAIDs as filling an opioid or NSAID prescription without having filled one in the preceding 180 days. They excluded those patients who were taking more than one analgesic agent or taking combination agents (an opioid and NSAID together), as well as patients with cancer, or those admitted to a nursing home or hospice. They also only included those taking the four oral opioids prescribed most commonly to the cohort (hydrocodone, oxycodone, propoxyphene, and codeine), transdermal fentanyl, and the 10 single-agent oral NSAIDs most commonly prescribed to the cohort. Subjects contributed information from the date of initiation until they experienced a fracture, died, became ineligible for the pharmaceutical assistance programs, or stopped taking the analgesic. Study outcomes were fractures of the hip, humerus or ulna, or wrist, identified using a combination of ICD-9 diagnosis and procedure codes. In total, there were 587 fracture events among the participants initiating opioids (120 fractures per 1,000 person years) compared to 38 fracture events among participants initiating NSAIDs (25 fractures per 1,000 person-years). After adjustment for possible confounders, participants initiating opioids remained more likely to develop a fracture than those initiating NSAIDs. Fracture risk was greater with higher opioid dose, as well as greater in those using short-acting opioids than those using long-acting opioids. Risk of fracture was greatest during the first 2 weeks after initiating therapy, especially for users of short-acting opioids, but not after this first 2 week period. Problem One: one issue in generalizing these finding to a wider audience is that the most common opioid initiated in the study was propoxyphene (5,552 individuals), followed by hydrocodone (3,805), oxycodone (2,476), codeine (371), and fentanyl (232). What??? Who in the world still prescribes propoxyphene? Apparently enough physicians to get 45% of this sample on this dangerous drug. Propoxyphene is a very bad actor as it is metabolized to a toxic compound – norpropoxyphene. It can cause seizures and cardiotoxicity. The FDA also has recently removed propoxyphene from the market. It does make you think that this study is more a study of poor opioid selection considering 45% of patients in this study were taking this drug. Problem Two: the patient population was just very different between opioid initiators and NSAID initiators. Opioid initiators were more likely to be taking benzodiazepines, antidepressants, PPIs, steroids, thiazides, and osteoporosis medications. They were more likely to have fallen in the last year, and to have taken more medications, made more outpatient visits, more frequently hospitalized, more likely to have renal impairment, and had higher comorbidity scores. The authors adjusted for many of the big confounders (see table), but it does make you think what else was different about these populations that may have made the NSAID group look better. For instance, level of pain and functional impairment were both not accounted for as confounders. It's hard for me to justify any conclusion about risks of fractures in this group without adjusting for baseline functional status. Problem Three: To assess for the possible effects of opioid dose and to control for dose in analyses, all opioid use was converted to milligram equivalents of codeine. The distribution of doses was divided into three groups (0–75, 76–225, and > 225mg equivalents of codeine per day) based on the initial prescription. I guess I'm confused on who would start an elderly patient who has not taken any opioids in the last 6 months on > 225mg of oral codeine equivalents a day (that's greater than 37mg of oral morphine a day)? Is the problem here an issue with study design, or more that when physicians don’t know how to dose opioids, patients are likely to fall and fracture? Will this study change my practice? It does give me some pause when prescribing opioids in the elderly. There is a very plausible link to falls and fractures, and we should all be more careful in the elderly. This study also underscores the education needed in the community on safe prescribing of opioids given that nearly half of the patients on opioids were taking propoxyphene. This study though should not be taken as an endorsement for NSAIDs. The numerous other adverse drug reactions of NSAIDs are not evaluated in this study and should not be under-emphasized. Let's here from you. Will it change your practice? Comment below at Geripal. Great review! There seems to have been a lot of these studies recently examining potential risks of opiod treatment. The interpretation of these studies is VERY complex. In terms of evaluating these studies, readers should be aware of an important concept termed "confounding by indication." I know that phrase sounds like a mouthful, but it is worth some effort to understand this concept, because it is crucial to the interpretation of opiod studies. First--what is confounding? In terms of a study of opiods and falls, confounding would mean that even though persons who take opiods have more falls, opiods are not the CAUSE of the falls. It would mean that people who take opiods are very different than persons who do not take opiods---and it is these differences rather than the opiods explain the falls. On to "confounding by indication"--a big issue in the study of all drugs. This would mean the confounder is embedded in the reason you take opiods in the first place. In other words, confounding by indication means it is not the opiods themselves that are the reason for falls. But it is the indication or problem (pain) that led to the opiod prescription. So, in this study, confounding by indication would mean that the reason opiod users have more falls than NSAID users is because they have more pain than NSAID users. It is impossible to know for sure whether this is the case in this study. But, it seems very plausible that providers are more likely to prescribe opiods to persons with more pain. Further, it is almost certainly the case that those with more pain will be more likely to fall. The reason for this is that pain is very strongly associated with functional impairment, and functional impairment is a huge risk factor for falling. For example, our group published a study showing dramatic levels of functional impairment in persons with moderate to severe pain. Persons with pain had levels of functional impairment similar to those without pain that were nearly 3 decades older. The confounding by indication problem makes this and most other studies of opiod risk very hard to interpret. Very few of the medication databases that generate these studies are able to even come close to accounting for the confounding by indication problem. For example, this study was not able to control for either pain severity or level of functional impairment. So, this study does leave me fairly convinced that persons treated with opiods (at least the opiods used in ths study) are more likely to fall than persons treated with NSAIDS. However, it provides meager evidence that opiods are the cause of the falls. The whole issue as to whether NSAIDS or opiods should be the first line therapy for chronic pain in older persons is profoundly important, and it is a shame we have so little evidence to guide us. This question demands a well done randomized controlled study. I have difficulty imagining a more meaningless study design. The NSAID group and the opioid group were anything but comparable. It was in no manner randomized, and there appeared to be no effort to compare comparable groups of patients. The majority of patients in the opioid group was treated with propoxyphene, which has been shown to be no more effective than acetaminophen for analgesia and has all the toxicities of meperidine. Then there was hydrocodone, oxycodone and fentanyl. We do not get to know exactly how these opioids were used, or how often fentanyl was used in the opioid naive. The only thing I can glean from this "study" with certainly is that opioids used badly is a bad idea, which I think we already knew. As a geriatrician with palliatice expertise, I had to look up what propoxyphene was and how it works! A problem I encounter is that some providers consider both opioids and NSAIDS unacceptable choices for older patients, leaving acetaminophen as the only choice for chronic or episodic pain. (And I admit that it's certainly worth a trial and does work well for a minority of patients.) But it seems physicians in general are less and less willing to prescribe opioids to anyone for chronic pain. I've heard a slogan at one hospital is "we're Oxy-free"--a protocol making it very difficult to prescribe oxycodone. It feels like we're not making much progress.